How We Win’s message is urgent: America and its allies can defeat extremism, but not until we significantly shift our approach. We must counter extremism intellectually. Extremists are preying on a rising generation of nearly one billion Muslim millennials and Gen Z who are in the midst of an identity crisis, vulnerable to extremists’ seductive, intolerant, “us” versus “them” ideology, delivered using the latest technologies and real-life peer-suasion. Drones and special forces operations won’t destroy extremism at its root like a grassroots war of ideas will. 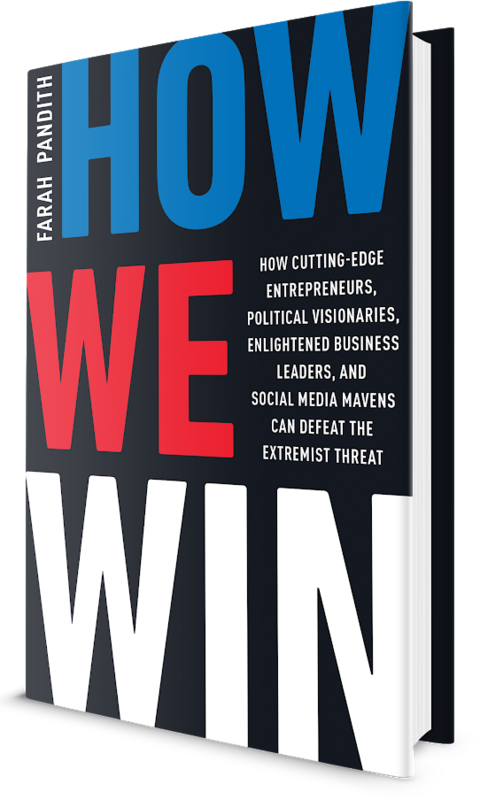 In How We Win, Farah Pandith reveals emerging data, on-the-ground stories, and proven solutions. How We Win sounds the alarm—and speaks candidly without the muzzle of the U.S. government. After thousands of informal discussions over the past decade, Pandith shares the naked truth of how Muslim youth reacts to American foreign policies and perceived “hypocrisy.” She describes in vivid detail how a Florida preacher threatening to burn the Qur’an laid a foundation of distrust and hate for America—from Paris to the jungles of Cambodia. She shares the most intimate hopes and fears of Muslim Millennials. Everywhere Pandith traveled, she found that Muslim communities are vastly—almost inconceivably—different from one another. Yet, they share only one basic thing: a crisis of identity. Many Muslim youth are agonizingly confused about their place in the modern world, a world driven by stereotypes and soundbites. And in their search for answers, some embrace extremist ideology. Extremist voices saturate both the virtual and real worlds with deadly divisive rhetoric. A quarter of our planet—1.6 billion people—is Muslim, and 62 percent of those Muslims are under the age of 30. Pandith illustrates how extremist ideology will fuel global instability and conflict if the world doesn’t take action. She courageously reveals the role of Saudi Arabia in the system underlying extremism. Extremism is a virus infecting individuals and entire communities, shattering lives, destroying families, and disrupting the global economy. It is spreading rapidly, and it must be stopped. How We Win offers hope. Pandith explains how government, the private sector, and civil society can help Muslim youth solve their identity crisis and in turn build a safer, more stable world. Her perspective and insights are rare, bold, and important. By focusing on human behavior and cultural influence, she convincingly explains how companies must play a role that has—so far—been absent. She demands more from the governments and multinational organizations. Her positive message is a hopeful chapter for Muslim youth, and the world at large. Pandith’s prescription drowns out the voices of extremists by supporting new concepts, causes, and charismatic leaders for young people.